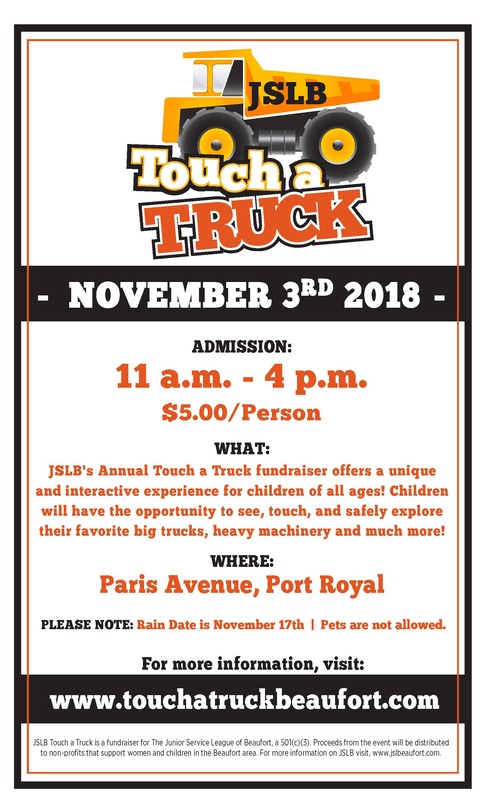 The 3rd Annual Touch a Truck will be held on November 3rd, 2018!! Proceeds benefit local nonprofits supporting women, children, and families in Beaufort! Tractors, trucks and tons of fun – Touch a Truck is a family event unlike any other in the Beaufort area! Whether you’re a parent, a child, or a child at heart, there will be plenty to do at the 2nd annual fall fundraiser for the Junior Service League of Beaufort (JSLB). This unique event offers opportunities to climb, touch, learn and play on some of the coolest vehicles around that build, serve and protect our community. Participants will be able to sit in the driver’s seat and imagine what it is like to operate the vehicles as well as learn more about them from the various sponsors and donors. Truck-touching have you tuckered-out? Just head on over to the entertainment area for face painting, bounce-houses, and other surprises to keep imaginations running! When you’ve worked out your mind and worked up an appetite, there will be plenty of food, live music and beverage options available to enjoy while resting in the shade of beautiful Paris Avenue. Not only is the event a ton of fun, but it’s also all for a good cause. Proceeds from the event go right back into our community via JSLB grants distributed in May each year. The JSLB is devoted to enriching the lives of women, children, and families in our Beaufort community. Your participation in engaging events like Touch-a-Truck helps the League continually distribute funds and time right back into this place we call home. All of this could not be possible without our wonderful sponsors. If you are interested in sponsoring our event please contact us immediately! Check out this year’s Press Release! **Help Us Spread the Word: Every conversation, share, post, email and flyer makes a huge difference in getting the word on our event. If you have questions, please contact Communication Director, Jenny Sanborn at communication.jslb@gmail.com. If you have any questions about the event, please contact Chairwoman Kristin O’Neal by email or President Lindsay Gifford by email. Learn more about our sponsors by clicking on their logos.